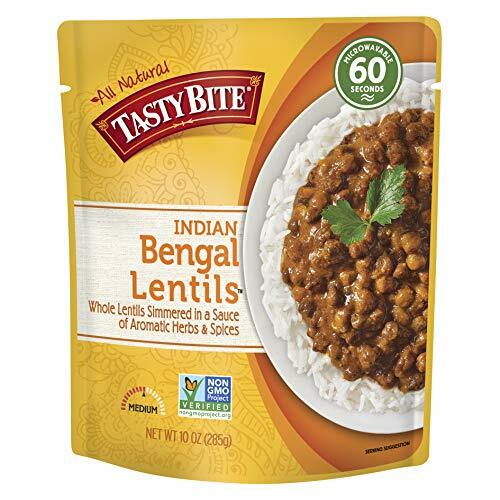 BOLD SPICES: Tasty Bite's Bengal Lentils Indian Entrée is a delicious way to bring bold, Indian spices to your dinner table. Whole lentils cooked in a light gravy of aromatic herbs & spices. The perfect marriage of hearty nutrition and exquisite flavor. FAST, FLAVORFUL, ALL NATURAL: For close to 25 years, Tasty Bite has been making fast, flavorful and all natural ethnic food - including entrees, sauces and rices - to delight consumers, with a focus on supporting local farms and protecting the environment. BOLD SPICES: Tasty Bite's Brown Rice Lentils is a quick and delicious way to bring bold, international spices to your dinner table. 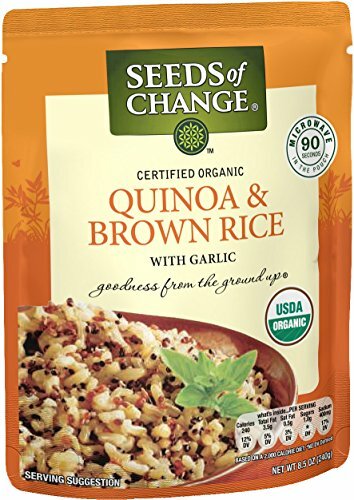 We gave this organic brown rice a protein and flavor boost by adding hearty lentils & aromatic spices. Spice up your dinner. 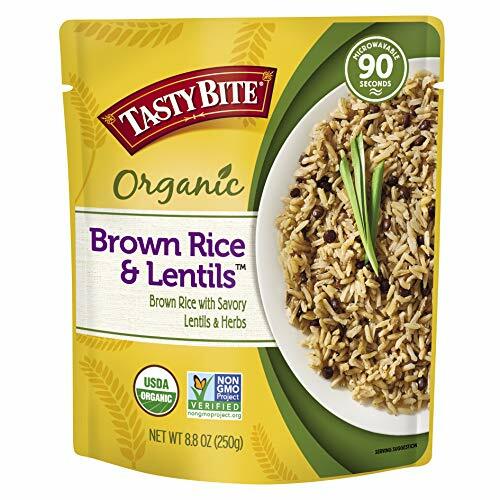 EASY AND DELICIOUS: Tasty Bite's Brown Rice & Lentils makes it easier than ever to have the delicious flavors of Indian spices, sauces & stews in no time at all. Toss the packet into the microwave for 90 seconds & enjoy your delicious, spice-balanced meal. ANCIENT TRADITIONS, EASY MEALS: Flavorful Indian recipes have evolved over thousands of years. We've taken this wisdom and sealed it in a convenient package. Our fresh vegetable and lentil Entrées deliver you centuries of taste in less than 90 seconds. 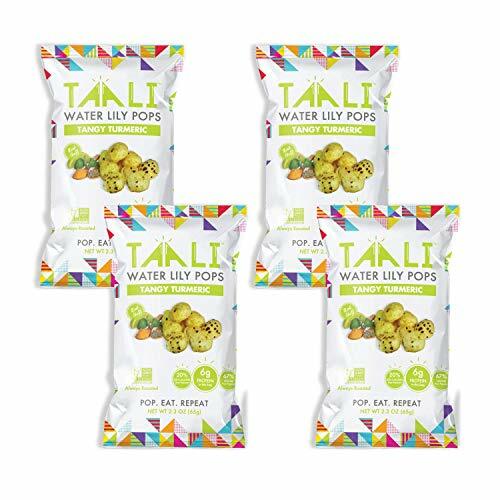 Convenient 3 flavor varitey pack, each 10 Oz. 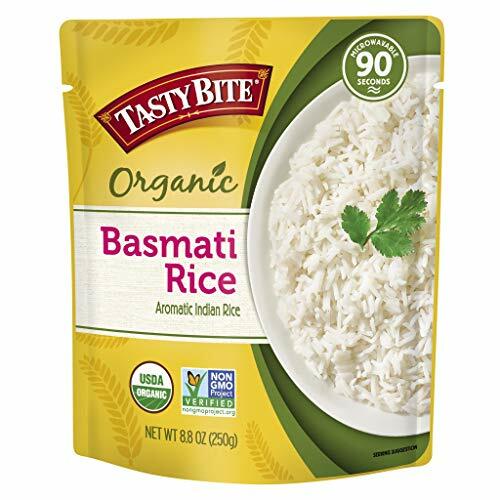 SIMPLE AND CLEAN: Tasty Bite's Organic Basmati Rice is a great addition to any dish. Fully cooked & microwaveable, this simple, aromatic organic basmati rice is delicious with flavorful Indian curries or tossed with spiced vegetables for a light lunch. FULLY COOKED & READY TO EAT: Tasty Bite's rice packets make dinner prep easy! They come fully cooked and microwaveable, so you're just 90 seconds away from delicious, perfectly steamed rice at any time of day. Try with a sweet curry sauce or stir fry. CONVENIENT AND QUICK: Just pop the Tasty Bite rice packet into your microwave for 90 seconds & you'll have delicious, perfectly steamed rice ready at a moment's notice if Uncle Joe stops in for an unexpected visit or Sally brings a friend home for dinner. 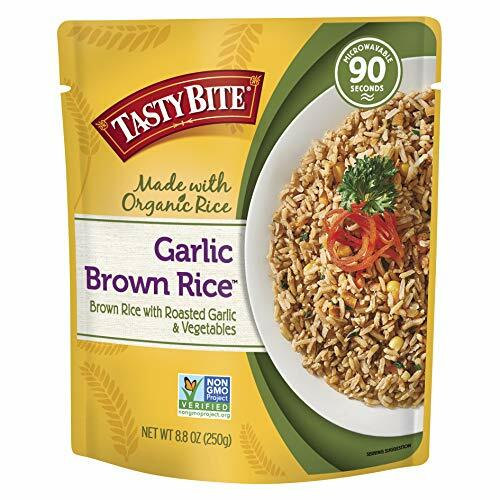 NUTTY WHOLE GRAIN: Tasty Bite's Brown Rice Garlic is a great addition to any dish. Fully cooked & microwaveable, this nutty, garlicky brown rice is delicious w/ flavorful stir fries, in bright salads, or as a delicious, flavorful addition to soups & stews. 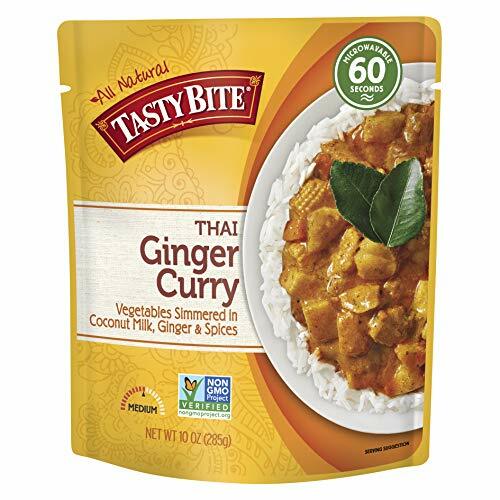 BOLD SPICES: Tasty Bite's Thai Entrée Penang Ginger Curry is a quick and delicious way to bring bold, Thai spices to your dinner table. Penang Ginger Curry has fresh vegetables simmered in Coconut milk, w/ ginger & spices giving it a great kick of flavor. EASY AND DELICIOUS: Tasty Bite's Thai Entrees make it easier than ever to have the delicious flavors of Thai curries, sauces and stews in no time at all. Toss the packet into the microwave for 60 seconds then enjoy your delicious, spice-balanced meal. ANCIENT TRADITIONS, EASY MEALS: Get a taste of Thailand without leaving your kitchen. From the creaminess of Coconut Milk to hints of Chili heat, Tasty Bite Thai Entrees infuse robust flavors & spices with a diverse assortment of your favorite vegetables. 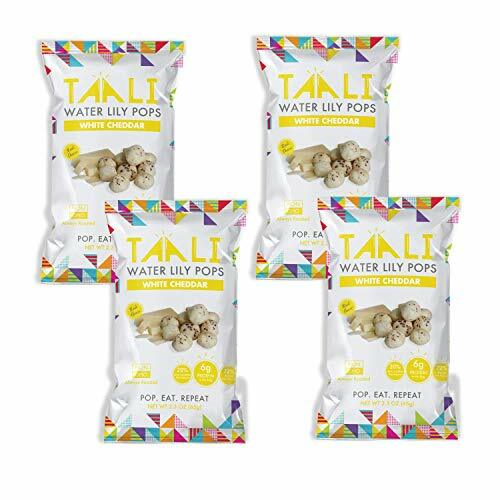 SIMPLE INGREDIENTS FOR REAL TASTE: Earthy & wholesome snack made from popped water lily seeds. 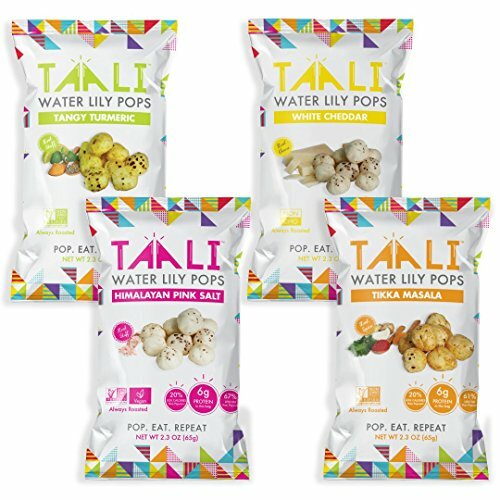 Taali takes pride in using real ingredients that taste great! 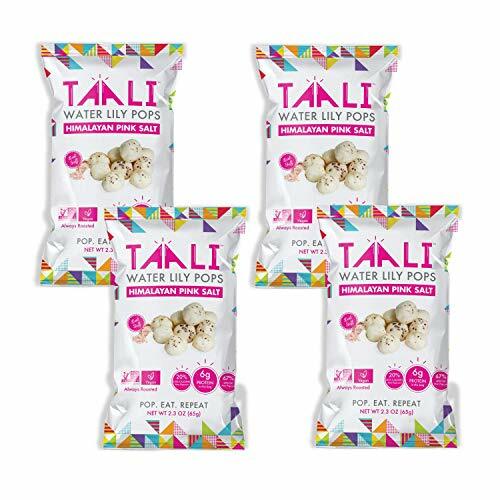 With 67% less fat & 20% less calories than the leading popcorn brand, you'll be able to snack on with zero guilt. PLANT BASED PROTEIN: With 6 grams of vegetarian protein, you will finally have a great answer to the dreaded question... "but where do you get your protein"? POP. EAT. REPEAT: A delicious snack, rich in antioxidents with a low glycemic index that leaves you feeling satisfied with fewer calories - it's a diabetic snack good enough for anyone to eat! Sprinkle onto fruit or stir into cake, muffin, or cookie batter. Add to hot or iced tea. 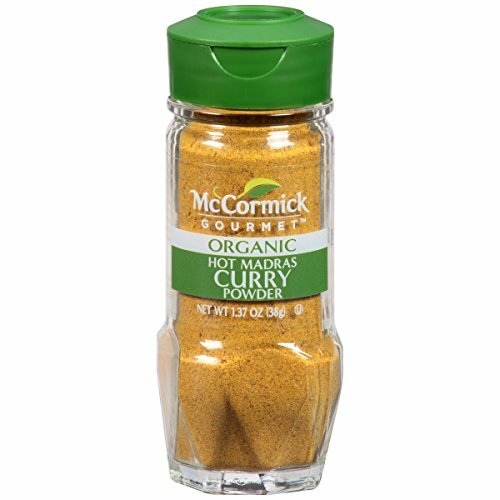 Perfect for stir frys, marinades, and sauteed vegetables. HEALTHY CHIPS: Lentil crisps make the perfect healthy snack. They have less fat than standard potato chips and boast 7 grams of protein, 5 grams of fiber, and 12% iron. Plus, they are gluten free, GMO-free and vegan. Without trans fat and cholesterol, you will be more atisfied with this snack option than with traditional potato chips. EASY TO MAKE: These lentil crisps are easy to make! Heat them in the microwave, oven, pan, stove, or grill for 60 to 90 seconds. Instead of spending time kneading dough and letting it raise, just pop these lentil crisps in the microwave, and they will be ready to eat in no time at all! Perfect for kids and for adults. FLAVORFUL PAPADUM: Papadums (poppadoms or papad) are a staple of Indian food. An Indian papadum is similar to a tortilla or flatbread. It is thin, crispy, and easy to cook and digest. They are packed with nutrient-rich lentils and traditional spices. Our lentil crisps have been sun-dried and sprinkled with a mild blend of spices for the best flavor. Eat with curries, dips, or other sauces. 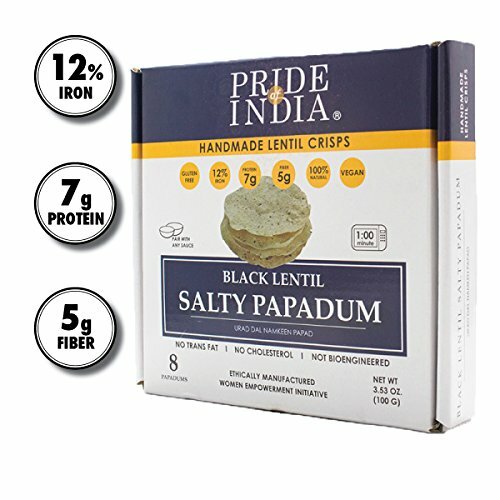 ETHICAL SNACK: Pride of India papadum lentil crisps are handmade and ethically manufactured. Each purchase of our lentil crisps supports our women empowerment initiative and small scale industries in India. Get 6 boxes with 8 lentil crisps per box in this package of salty black bean namkeen papadums. Gently steamed, fragrant Thai jasmine rice is sealed to preserve freshness. Mix of zesty lime and herbs, this sticky rice is perfect for a side dish or recipe. Convenient, microwavable tray is ready to serve in 2 minutes. 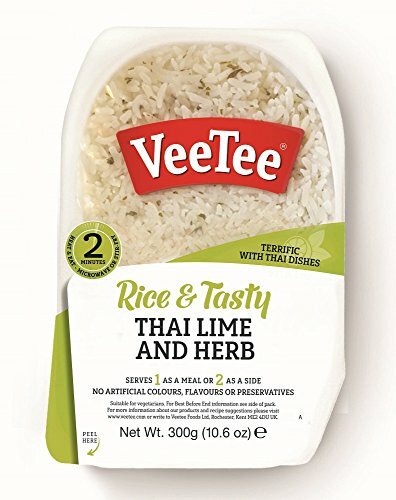 VeeTee rice is gluten free with no artificial colors, flavors or preservatives. Keep on hand in a dorm room, the office, or for a quick, delicious meal. SIMPLE INGREDIENTS FOR REAL TASTE: Earthy & wholesome snack made from popped water lily seeds. 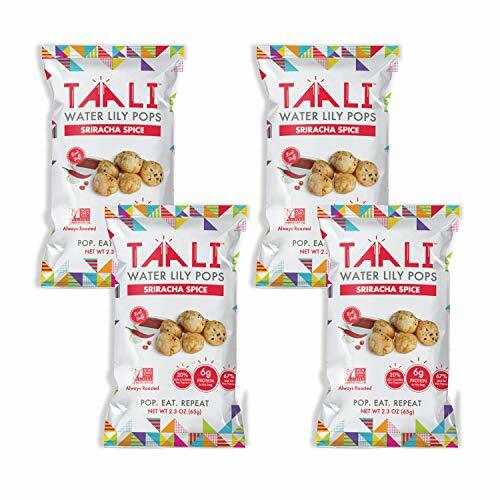 Taali takes pride in using real ingredients that taste great! With 72% less fat & 20% less calories than the leading popcorn brand, you'll be able to snack on with zero guilt.